1000's of Wood & Metal Frame Samples both in store, and catalogs to choose from. WE PROVIDE THE BEST PERSONALIZED & PROFESSIONAL CUSTOM FRAME SERVICE. WE HAVE A LONG LIST OF SATISFIED RESIDENTIAL AND COMMERCIAL CLIENTS SINCE 1982. WE USE ONLY THE BEST MATERIALS ON ALL ORDERS. EACH OF OUR FRAMERS HAS OVER 20 YEARS EXPERIENCE IN DESIGN, LAYOUT AND FRAMING. 1) They hire part timers with little or no Art & Framing experience to run their framing counter. Someone who just received a crash course in framing is not where you want to bring your valuable art, certificates or memorabilia. 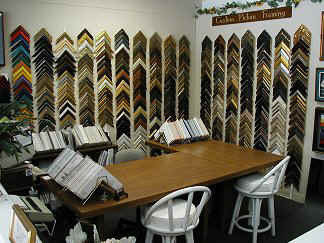 Our framing counter has adult career professional framers with 24 or more years of experience. 2) Your work often leaves the premises to go to a warehouse where it is placed on the assembly line for framing. At our store your work never leaves the premises and is given personal time and attention. All work is done on the premises by professionals. 3) Their 50% off coupons or Sales are a lead-in towards over priced Frames and Services. Our 20% coupon is often a lower price then their supposed 50% off coupon. Family owned and operated since 1982, we do not have the big building overhead nor the dozens of employee salaries to pay. Our prices are the best and have always been the best and our service is unmatched. We are serious about framing. 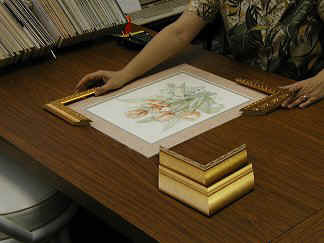 Over 24 years experience custom picture framing. No order too large or too small. Helping residential and commercial clients since 1982. Needlework, certificates, sports shadowboxes, object mounting, sports memorabilia, oils paintings, archival framing, communion dresses, wedding objects, baby clothes, fine art, oils, etc. Come see our photo catalog of custom framed projects which spans over 24 years of our professional custom framing service. (813) 685-9636 Free estimates and framing consultations. Experienced career professionals at design, layout and workmanship. What is the big difference? Professional picture framing protects your valuables. Just buying a department store frame or going to a frame shop that cuts corners may place your photos, certificates or valuables in jeopardy. Store bought frames or frame shops which cut corners use cardboard, packing tape, masking tape, scotch tape, chip board and other dangerous "inexpensive" materials which over time deteriorate and can damage your valuables. Experienced and responsible custom framers use only approved materials when framing placing artwork into a time capsule which can safely protect your valuables. We only use the best of materials on all orders regardless of size or price.